I wanted to show you some photo's of my new, but not yet completely finished surcote. 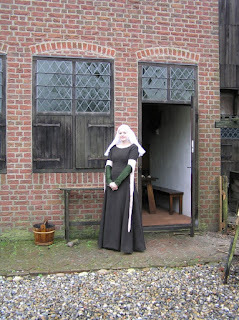 It is made with dark brown high quality wool, pale silk taffeta for the tippets and the torso part of the lining, and linen for the lining of the skirt. It still needs to get two slits in front edged with the same silk taffeta, and a pink taffeta border on the edge of the skirt. 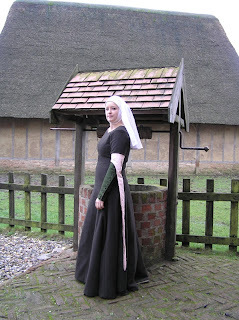 I lined the body part with silk to make it easier to put the surcote on, on top of the green dress I'm wearing underneath it (you can see the sleeves of it in the pictures). I based the dress on an example (f. 62v) from a manuscript held in the Royal Library of Belgium, Brussels. The manuscript (MS. 9427), a breviary, was made in commission of Lodewijk van Male between 1360-1368. The next 6 weeks I have to gather the final data for my phd. This means I have to visit different schools, travel a lot, talk to a lot of people... I really like it, and at the same time, it's also quite stressful! So, I will post about embroidered braids and linen embroidery in march or april (finally spring!!). This is the first of 2 or 3 (?) purses I'm going to make for next season's medieval fairs. 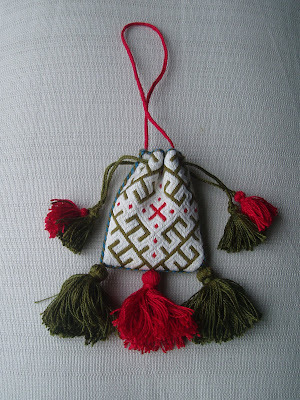 I forgot how much time it takes to finish a purse after the embroidery is done: embroidered braids, tassels, drawstrings... But I really like to combine different techniques, so maybe that's why I like purses so much.